Let’s not mess around here – if you’re a Marvel fan, two things are all but guaranteed. Firstly, you will have likely loved Avengers (in the UK it was called Avengers Assemble, but my version just says Avengers, and AA is a silly name, so there) and rated it high in Marvel Studios’ output so far, if not top of the pile. Following on from that, you will go and see Age of Ultron regardless of what anyone says. That’s fine! But I need to say something straight away – you will not get the same giddy thrill from this film that you got from Avengers. Save for a shot (shown in the trailer) of the entire team flying towards an unknown enemy in the first two minutes – a nod back to the climatic battle of Avengers – this film is about moving the team and the universe forward, for better or worse. The film opens with the afore-mentioned battle, a mission to retrieve a artefact we’ve met before in the series. Tony Stark (Robert Downey Jr) realises the implications of this – the idea of Avengers has always been to eventually render them surplus to requirements by seeing off all threats. Throw in a little encounter with a pair of newcomers along the way – Wanda and Pietro Maximoff (Elizabeth Olsen and Aaron Taylor-Johnson) and the need to protect the world before any of the team perish becomes more urgent. With the help of an unconvinced Bruce Banner (Mark Ruffalo) he creates probably his most impressive invention yet, but quickly realises he is out of his depth as his creation threatens the world. Thus the stage is set for an epic battle which takes in mind control (pitting Avengers against each other to divide and conquer) and some truly mighty action sequences. And the sequences are huge. The action scenes in Avengers felt slightly small in scale until the climatic Battle of New York, but here they are amplified, taking in whole cities and towns at a time. The much-vaunted Hulk vs Hulkbuster smackdown is an excellent piece of fight choreography, never spilling into Transformers territory (“I don’t know what’s going on”, “Why can’t they fit the whole robot into the screen”, etc.). There’s a great sense of scale here – this is a global threat being realised globally, not funnelled through the metaphor of one city as shorthand. The action travels from the fictional Eastern-European city of Sokovia to South Africa, South Korea and rural America. In between big fight scenes, however, we do get a decent amount of character development. This is especially concentrated around the Avengers who aren’t the subject of solo films – Black Widow, Hulk and Hawkeye all get significant amounts of screen time. 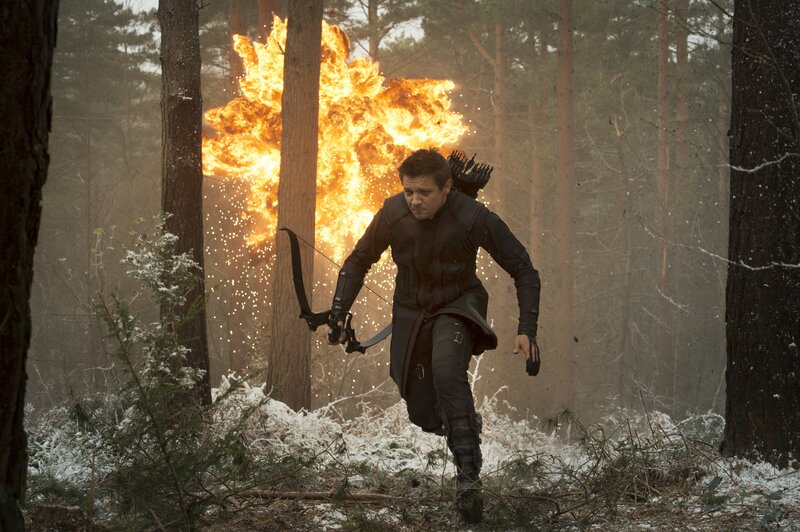 Hawkeye benefits the most, making up for his side-lining in Avengers with a fully realised back story. This does mean that the big three of Iron Man, Captain America and Thor feel sidelined – there is a Thor sequence which sorely feels like it was chopped for running time, ultimately having no impact on the film but setting up Ragnarok instead. In a film with at least 15 named and principle characters, this is going to be an occupational hazard. It was managed well in Avengers, but that was with less leads – this can feel overburdened at times, with everyone from War Machine/Iron Patriot (Don Cheadle, making the most of some very limited screen time) to Maria Hill (Cobie Smulders) popping up in slightly beefed-up cameos. This leads me to my main gripe with the film – Quicksilver and Scarlet Witch feel like the chips you still have to eat after you’ve finished your burger. It was a good idea when you ordered them, but now you’re looking at them and wondering if they were necessary. Scarlet Witch does redeem herself somewhat during the final battle, and provides a handy jumping-off point for the creation of Ultron, but these beats could have been allocated elsewhere. Having said that, the best new character doesn’t even exist for the first two-thirds of the film. We’ve heard Paul Bettany as JARVIS for years, but he’s finally rewarded with a physical presence as Vision. I really like Bettany and it was a real delight to see him here – Vision could look a bit more ethereal, but he nails the tone of the character completely and again makes the most of a small amount of screen time. It probably helps that he gets the best “HELL YES!” moment of the entire film as well. The main plaudits have to be saved for James Spader as Ultron. Created to protect the world, he quickly realises the best way to do that is to eliminate the Avengers. Spader’s crafty delivery is wonderful, and Ultron has the swagger of his motion-captured performance down – if you’ve ever watched Spader in anything, it’s easy to picture him instead of the menacing robot. His wisecracking delivery makes him the son that Tony Stark has never had, and is a real highlight. There are parts that don’t work. A blossoming romantic subplot feels slightly unnecessary, and the whole thing at times feels overburdened by what it has to set up in context of the wider universe (the events of Civil War, Infinity War and the aforementioned Ragnarok are all foreshadowed here). But ultimately it’s lots and lots of fun, despite being much darker than the first outing. And that’s all we can ever really ask for from Marvel – it’s what they’ve done best for years, in print and now on film.